The Vauxhall Corsa is a 3 and 5 door hatchback, the main competition comes in the form of the best selling Ford Fiesta and the well built Volkswagen Polo. 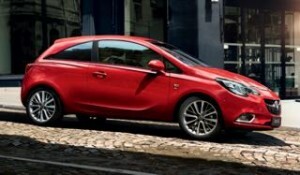 This new car is built on the existing chassis from the old car and external design is more evolution than revolution, which Vauxhall can be excused for as despite the old car being around since 2006 it still looks fresh and given that the Corsa is the best selling car in the Vauxhall range it’s too important to the brand to take big risks with. 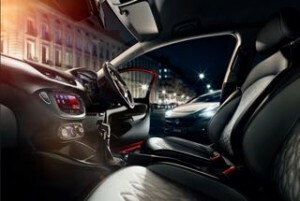 There are two new creases along the side of the car to add a touch of the Peugeot 208 style and the front grille and lights have taken a tip from the Vauxhall Adam, overall the new car is the same size as the outgoing model and the 285 litres of boot space and ample rear seats make it one of the larger cars in this class. The Corsa is a neat car, the dash is well presented and in Design trim and above the centrally mounted 7″ touch screen controls audio and the linked smartphone. 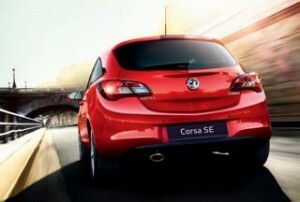 The Corsa is good to drive and comfortable to be driven in, the seats are not class leading but comfortable enough. To mobility customers the entry level car is the mid level ‘Design’ which is astonishingly well appointed and offers value above the competition as standard you get air conditioning, cruise control, 7″ touch screen audio and phone controller with DAB radio, 15″ structure (alloy lookalike) wheels, front fog lights, LED daytime running lights, leather covered steering wheel with audio controls, heated front windscreen and electric front windows. The sporty SRi adds 16″ alloy wheels, sports front seats and pedals, trip computer, heated and electric adjustable external mirrors, automatic wipers and lights and a 60:40 split rear seat. The SE adds heated seats, heated steering wheel and front and rear parking sensors. The Elite has 17 inch alloys, climate control, Xenon head lights with cornering function and a rear parking camera. Two petrol engines and a single diesel power the Corsa, only the 1.0 petrol is new, the 1.4 petrol and the 1.3 diesel have been around a while. The three cylinder one litre comes with either 90 or 113 bhp and is a cracking unit, quiet and able to pull from low revs, quick and economical too, with the higher output it can reach 62 miles per hour in 10.3 seconds (11.9 as 90bhp) claimed economy is up to 65.7 for the smaller output and 57.6 for the more powerful unit. For super economy the 1.3 diesel is the engine as it can return up to 88.3 miles per gallon (with 95bhp) and still hit 62 miles per hour in a respectable 11.9 seconds and produce only 85g co2. The 1.4 litre petrol, 90 bhp or 100 bhp with the addition of a turbo, can reach 62 miles per hour in 13.2 seconds and return up to 55.4 miles per gallon, this engine is also available with either a single clutch semi automatic gearbox (Easytronic) or a new 6 speed traditional torque convertor gearbox. Only the 1.4 engine is avaialble this quarter, a new Corsa is due Summer 2019.